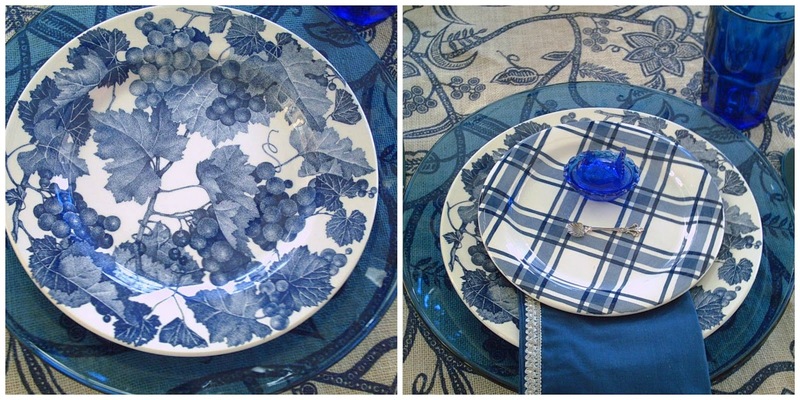 I couldn't make up my mind which dinner plate to use. The tan ones I preferred (they are both the same color one photographed in the evening and the other in the morning). When I looked at the full tablescape the tan with the tablecloth flowed so nicely in the overall look. 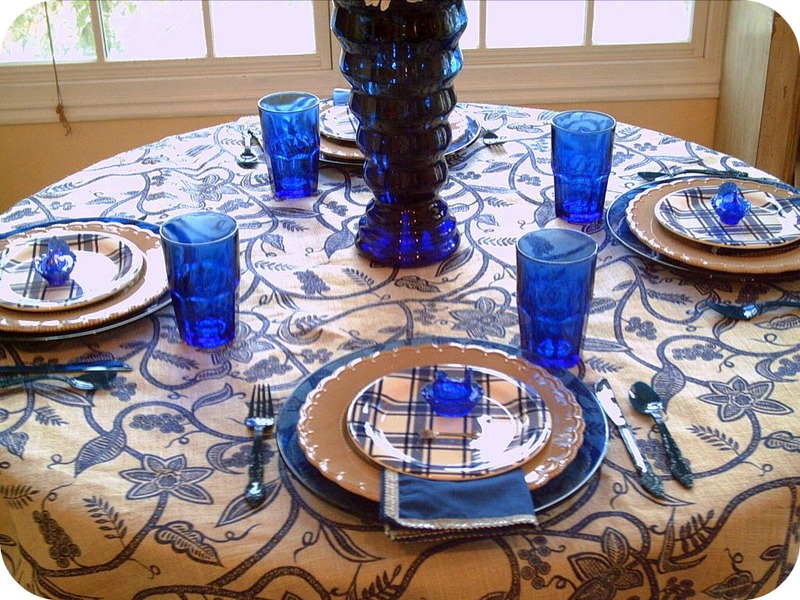 Though the blue grape pattern matches the grape pattern on the burlap tablecloth. 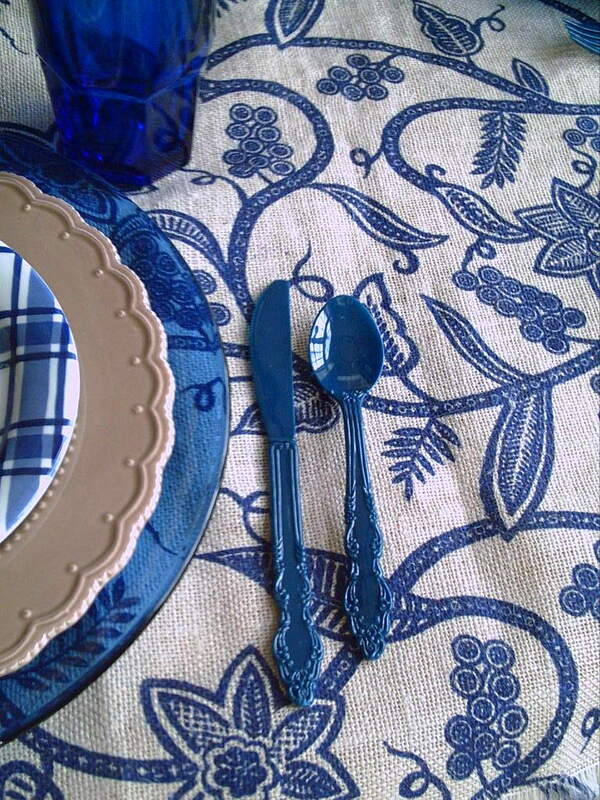 Dark blue flatware that I really like. I have this plastic flatware in several colors. 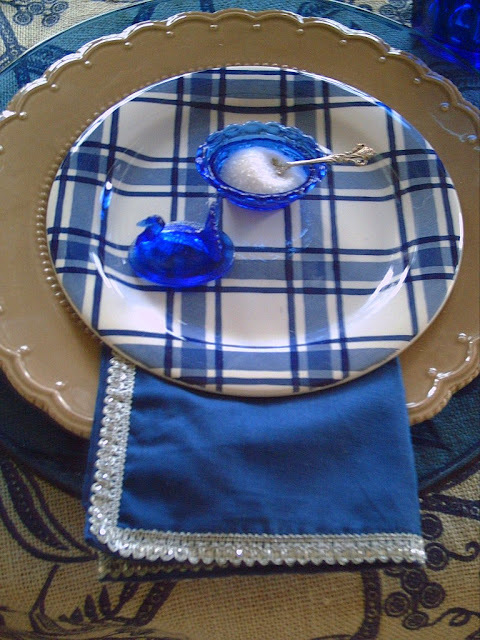 My inspiration for this table was the little Cobalt Blue Turkey mini salt cellars and cute little spoons. This unique Thanksgiving tablescape was an easy table to set up. I actually prefer this one to others I have done that are more ornate, elegant, or fussy. I enjoy the simplicity and ease of sitting down and relaxing with loved ones. Where the focus is on the company you keep and enjoying your time together. Oh I forgot, the food! I will be sharing this post at Between Naps on the Porch for Tablescape Thursday. Both plates are pretty, I love the blue grape plate, but I do like how the tan one adds a bit of interest to the stack. Very pretty! It is a refreshing color scheme isn't it! I've been doing fall decorating since September and ready for something different. When I decorate my Mom's dining table for Thanksgiving it will be simpler. Gotta have room for the food! 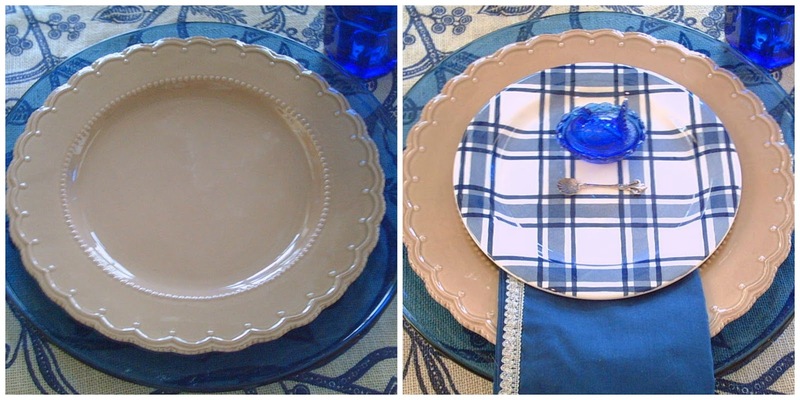 I like both plate choices- I guess I'd go with the tan just to add a little fall tone to it. I like the little blue salt cellars. 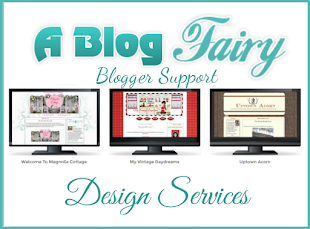 I never even heard of a salt cellar until I started blogging! This is beautiful! 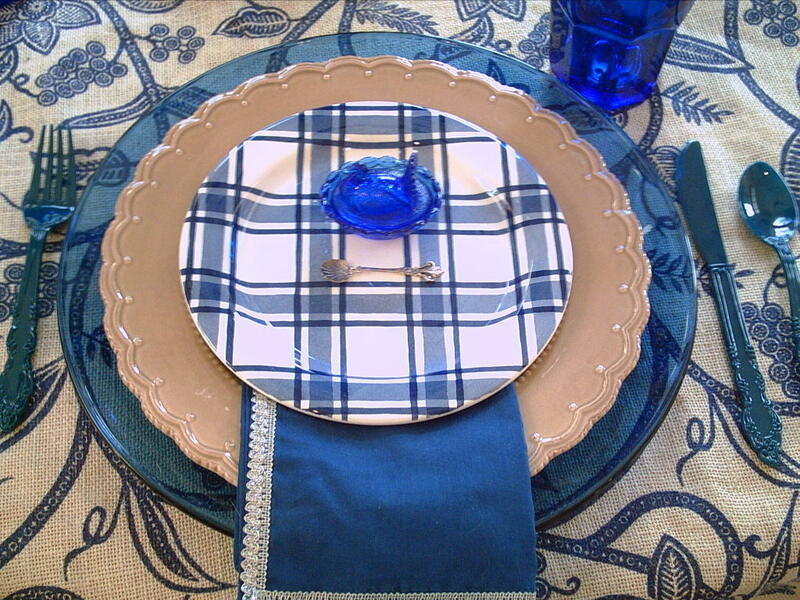 I am so in love with plaid now and those plates are calling my name. Your blue palette is gorgeous and I would love to take a seat beside the teens at this table! 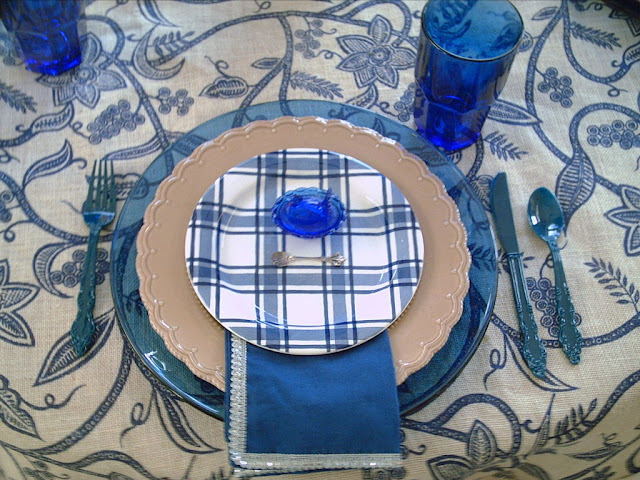 Love those cute blue plaid plates! 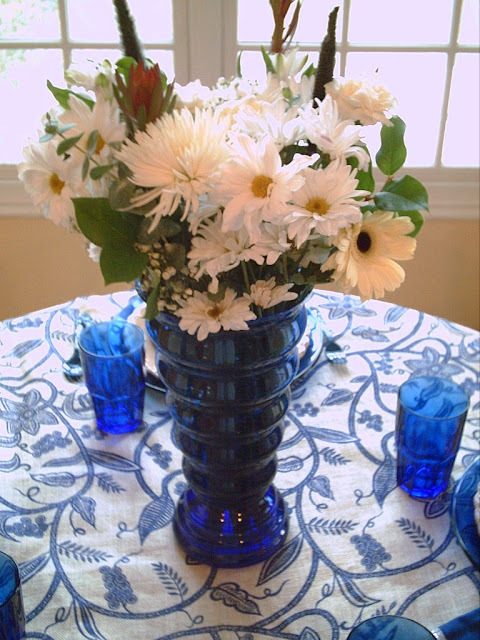 and to pair them with your table cloth jut adds so much interest. You can tell by my blog name that I was going to love your table! Enjoy your Thanksgiving. I have two of those blue paid plates and use them with my cobalt glass dinner plates and white porcelain underneath...love them! 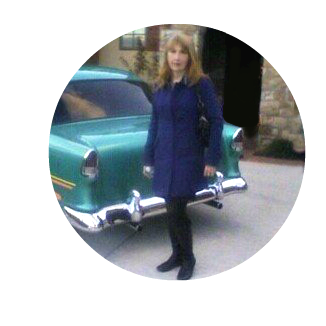 How pretty and different Valerie! 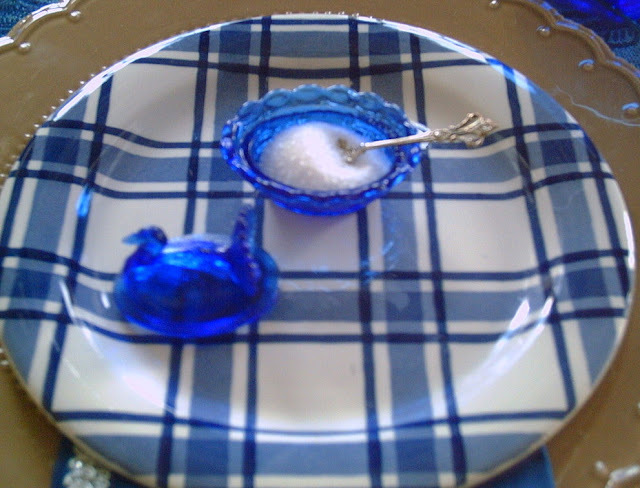 I just love your blue "turkey" salt cellars! By accident I deleted some comments. I am sorry. They were great comments. I was cleaning out my email inbox and I mistakenly deleted some comments from this blog post. What a cute table setting! 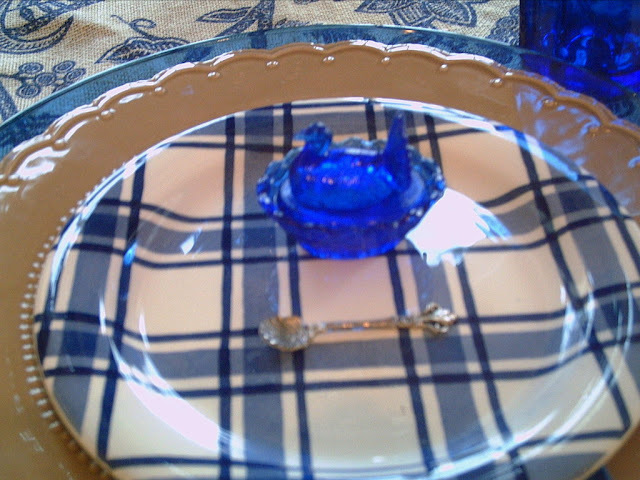 I love the little turkey salt cellars and itty bitty spoons! Have a Happy Thanksgiving!